Driver. Total available vacancies in this Indian Army 60 COY ASC SUP Type G Secunderabad Recruitment are 50 posts. Eligible candidates have to download the application from the official website. Send the prescribed application through post within 21 days from the date of publication in employment news. For the candidates who lives in Andaman & Nicobar and Lakshadweep, application submission last date is 28 days from the date of notification. Selection of candidates is based on Endurance Test followed by written test. Full details regarding written test and Endurance test are available in the notification. Age of the candidates should be between 18 years to 25 years for general candidates. Age will be relaxed for OBC category is 3 years and for Scheduled caste/ Scheduled tribes is 05 years. 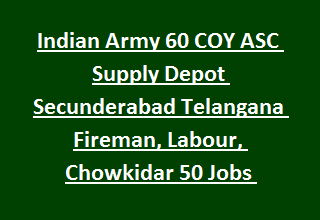 All details regarding 60 COY ASC Supply Depot Secunderabad Telangana Recruitment 2017 for 50 Fireman, Labour, Chowkidar Vacancies eligibility criteria, important dates, selection method, pay scale are mentioned below. Total vacancies available in Indian Army 60 COY ASC SUP Type G Secunderabad Telangana Recruitment are 50 posts. 1. Civil Motor Driver: 04 posts. 5. Chowkidar (MTS): 08 posts. For all posts minimum qualification required is Matriculation. Civilian Driver: must have heavy motor vehicle driving license with 2 years experience in driving HMV. Cook: must have cooking knowledge. Fireman: Must know the elementary principles of Fire Fighting methods, and physically fit. Height: 165 (without shoe), for SC/ ST- 2.5 cms concession will be given. Age of the candidates should be between 18 years to 25 years for general category. For Scheduled caste/ Scheduled caste 18 years to 30 years. For OBC 18 years to 28 years. Candidates will be selected for the current recruitment is based on Physical Endurance test/ Skill Test and followed by written test. Marks allotted to Physical Endurance Test/ Skill Test are given in the notification. Candidates who are selected in PET/ Skill test are only eligible for attending written test. Total marks are 100 and the question paper will be given in bilingual format. Minimum pass marks in written test are 40 marks. Candidates fulfilling above eligible conditions may send the application form through post before 21 days from the advertisement date. Affixing 2 passport size photographs, documents of Educational Qualification, Caste certificate, Birth certificate, Character certificate, proof of residence with the application to the address mentioned below.